Objective: To see how the length of bench proof after shaping (before retardation) impacts on crumb. 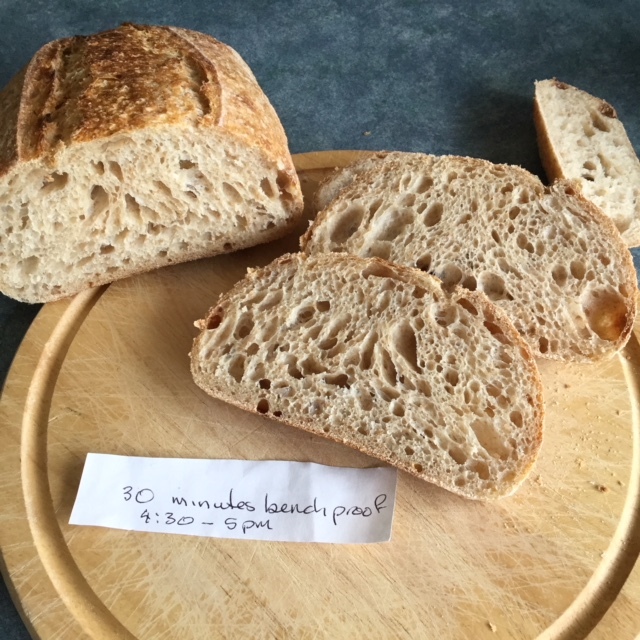 Levain: Refreshed yesterday, final build overnight. 11.45 am add levain. squished dough out and smeared levain over, dimpled it in and folded dough - a bit like laminating. repeated the folding then did 100 SLAFs. 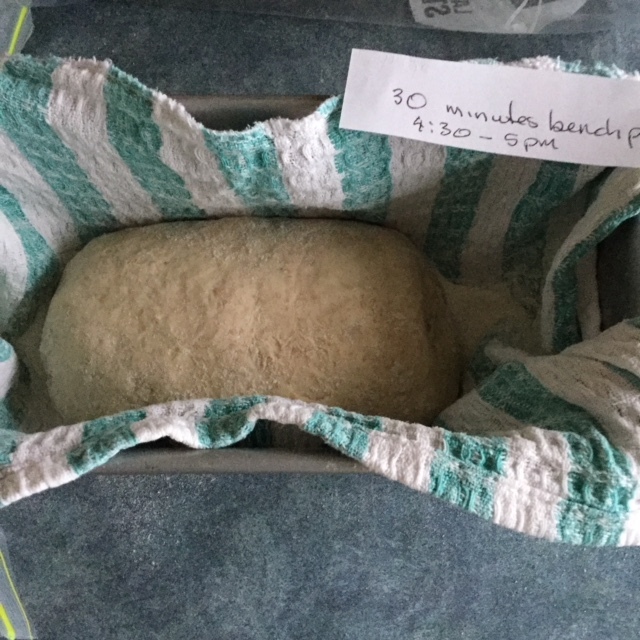 dough came together nicely but I felt it needed a little more water, so after resting it for 5 minutes I patted it out, sprinkled the 20 g salt over it as well as another 20 g water. folded it all up again and did another 110 SLAFs. Dough felt really good and was no longer sticking to everything. About an hour and a quarter later, dough was somewhere in the region of 30-50% risen, surface was domed and here were surface bubbles. 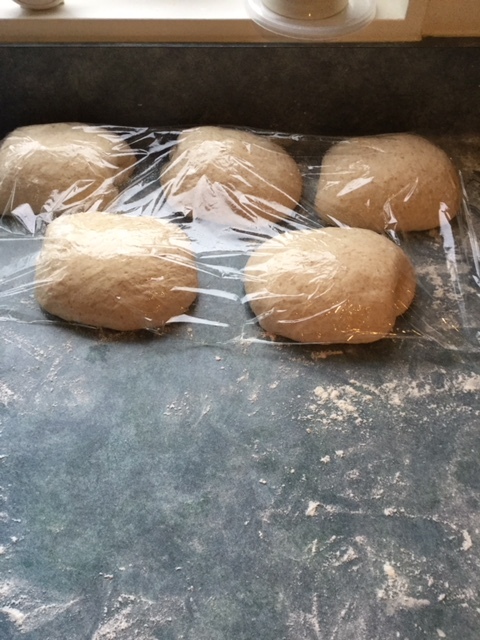 Divided the dough into 5 and preshaped each into an oblong and rolled it up. Rested 30 minutes before final shaping. Decided to try Trevor’s “un named shaping” method which is nice and simple. I tried to treat each loaf the same. 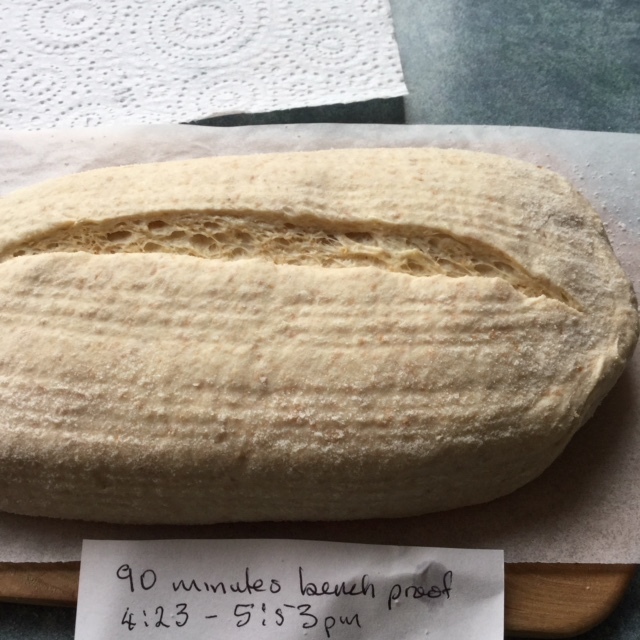 The 5th and final loaf was shaped and popped straight into the fridge. All tucked up and ready for sleeping! Tomorrow morning I will bake them one after the other. I had hoped for 10 - 11 hour retard but things went really well so they will actually get 14 hours in the fridge before baking. Fingers crossed that the fridge stays cold enough to hold them. Just looking at them when I made the photos, I think 2 hours was too long and that 1 hour or even 1.5 hours would be better. 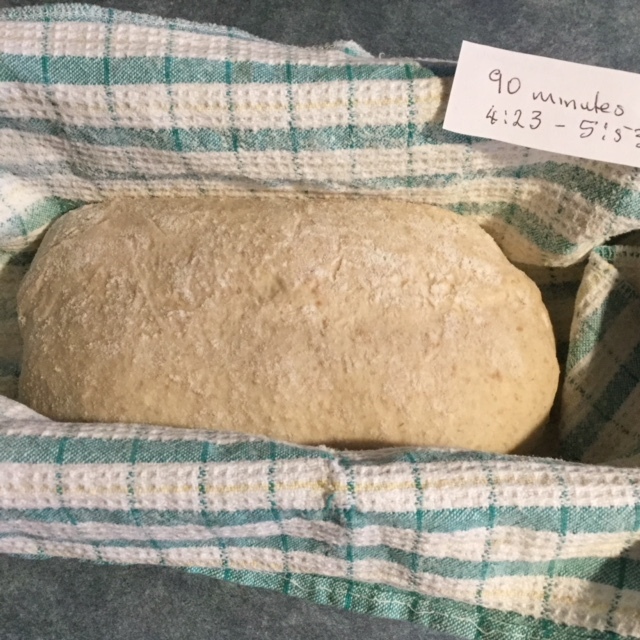 Just had a quick look at one of loaves, so far so good and fridge temperature is nearly back to 4 degrees C.
Really interesting result so far, not quite what I expected. 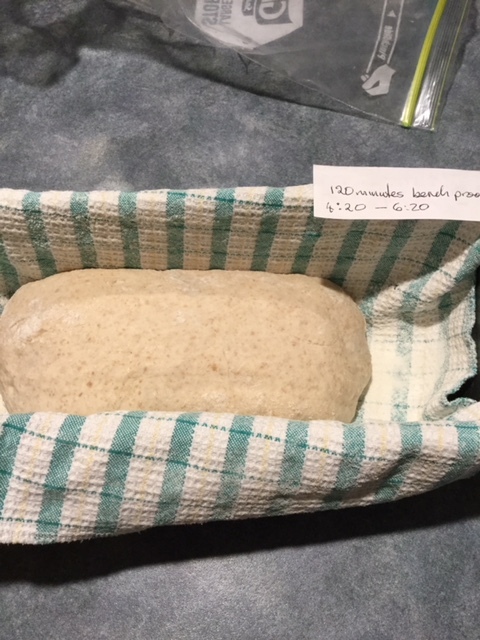 I proofed the dough in bread pan that were roughly the same width but not the same length. 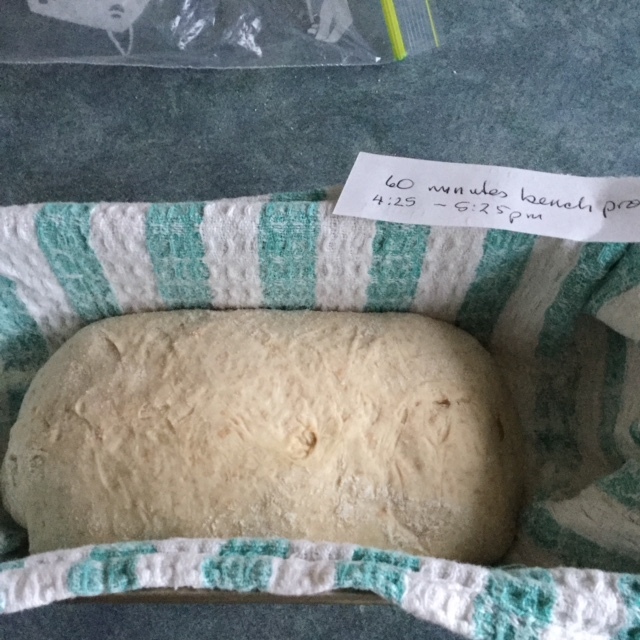 Here are the photos of the dough scored, just before baking after 14 hours retardation. All were baked at about 430 deg F for 11 minutes lid on DO and 12 lid off. The oven was reheat 5 - 6 minutes between loaves. 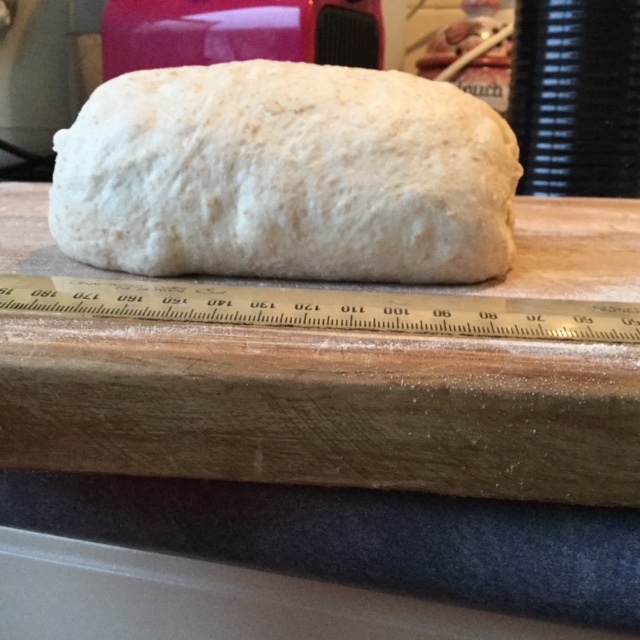 Unmoulding the dough, I had the feeling they were getting bigger - longer rather than higher. The lead photo really shows this. 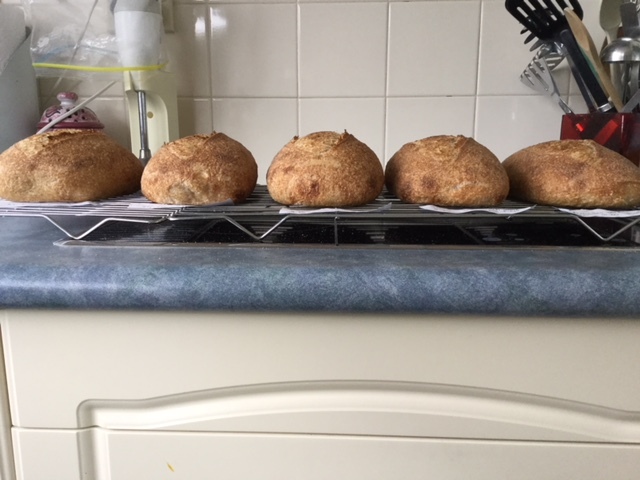 The loaves are lined up at the back. They get progressively longer as the bench rest period increases. Did not see that coming! 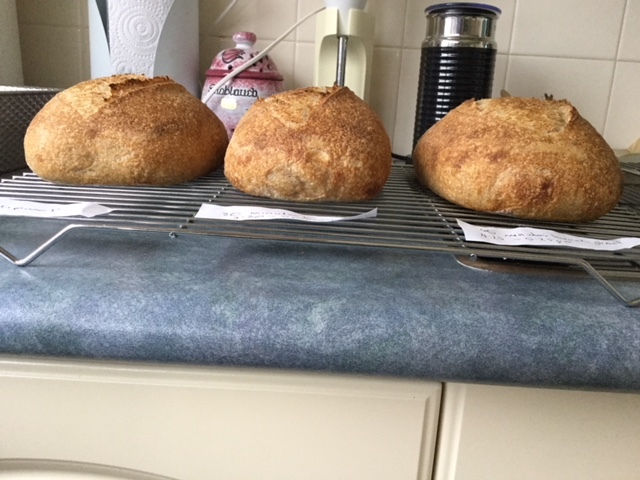 Maybe I have to do a partial repeat but use a banneton so that the loaves must conform to a specific size, then maybe the height at overn spring will show more, just guessing here. Now you can see a bit of difference in height. I see this even when looking from a distance. 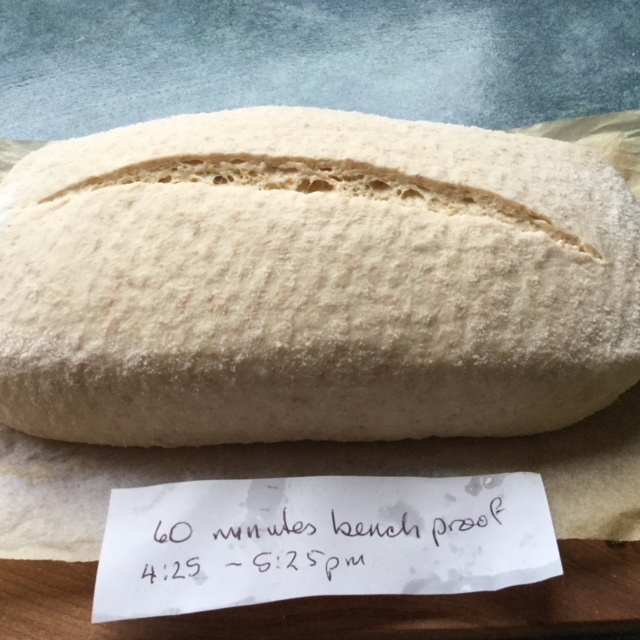 So at this point, without seeing the crumb I think that the 60 minute bench proof is my pick. You can also see that the 90 and 120 minute bench proofs have flattened somewhat - maybe this is the extra length. Crumb shots will come as they get eaten, lol, maybe the first one today..
Tuesday 25th. 60 minute bench rest. Not sure it has made much difference. 26th September - 90 minute bench rest. Thought at first, no difference as in first photo. Then I cut a few more slices. Now it looks a bit different! Only one more to cut - wonder what the 120 minute bench proof will be like. Will be a few more days till I cut it though. Final crumbshot. 120 minutes bench proof. Not as good as 90 minutes. 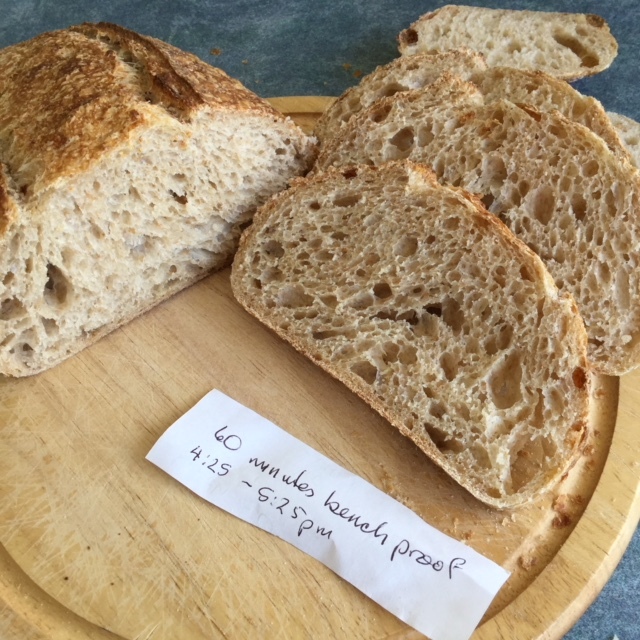 Sofar, in this comparison the 90 minute bench proof has given the most open crumb when cold retarted. 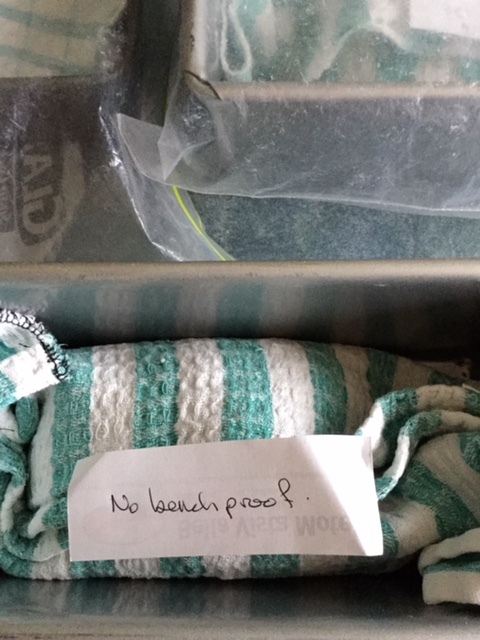 Looking at your loaves, I think I like the no bench proof one. I certainly like that crumb! This is an awesome experiment!! thought it may have denser but nope. Its going to be hard waiting but hopefully crumbs will show some differences. Leslie, first off I want to thank you for investing the time and energy to perform this test. I know how demanding these test can be. Testing and then sharing the results gives all of us information without having to go through the trouble ourselves. Collectively we can learn more about bread than we can individually. Thank You! First bread is beautiful, can they possibly get better? I have been an advocate of some bench proofing before retardation. My reasoning being, the yeast do better during the cold proof if allowed to activate after shaping. Looking at your results something comes to mind. 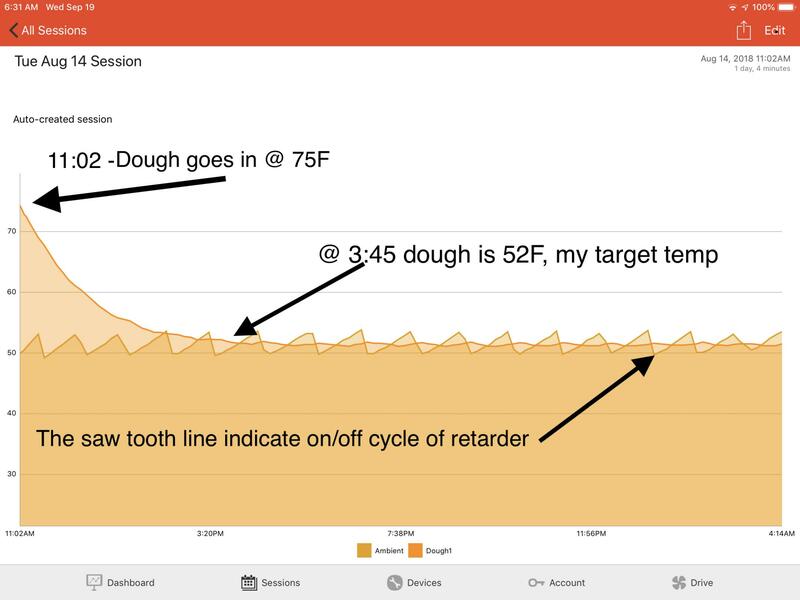 It takes around 5 hr for a RT dough to cool down to a retarded temp of 3-4C see image below). I know this because I have run thermal data logs and charted the process. During that time, especially in the beginning we would have expect some yeast growth and inside the fridge. I really like testing, because it either confirms or disproves what we think we know. I look forward to comparing the crumb of the other breads. I hope the test is conclusive. Sorry Kat, I missed your post. (I think there are some new post that I don’t get email notification). I’ve read where others mentioned the same thing. To answe your question about the length of retard of the charted dough above. From the looks of the chart above, it went a little over 15 hours. Unfortunately I don’t remember the bread. But Im sure it wasn’t ruined. you were just testing here or do you proof at 52°f , I agree with Kat that is warm and you would have to watch carefully. if it takes 5 hours to get to 52°f (11°c), how long to get to 37 or 40 (3-4°c). would the dough size also impact on this? I am thinking out loud... baguettes would cool faster than 800 g dough? how would it work when you do as I did, adding 400 g dough every 30 minutes? I wish I could cut the loaves now, but we will wait and I will add pics as i go. Leslie, I’d have to chart it to know for sure, but experience and ny best guess is s that it takes very close to 5 hours to get to 3-4C also. At first this seems odd, but remember, the temp of the retarder are set to drop lower with a target of 3-4C. At this time I believe ~5hr is the common time to come to temp. Are others also not getting email notifications on some of the new post? in the fridge so I don’t know from experience. I always thought it took 3-4 hours to cool in the fridge. Re notifications, you have to select “all comments” i think. Sorry, I missed your post. Yes, I do proof above 50F fairly often. I do this so the dough does ferment slightly during the retard. lol, shall I send you some? I do not know if I lost the information there in your posts, are very detailed and recorded, congratulations, but do you know what the average temperature in your kitchen during the proof on the counter? all day was 22 - 23°c (71-73°c). Warmer than I expected, but good for this experiment. I love the shot where you have them all side by side and just seeing the difference there without the crumb shot!!! oh totally got carried away and got to say that the crumb of the first one looked great as always!!!! and they all opened up to baby ears. 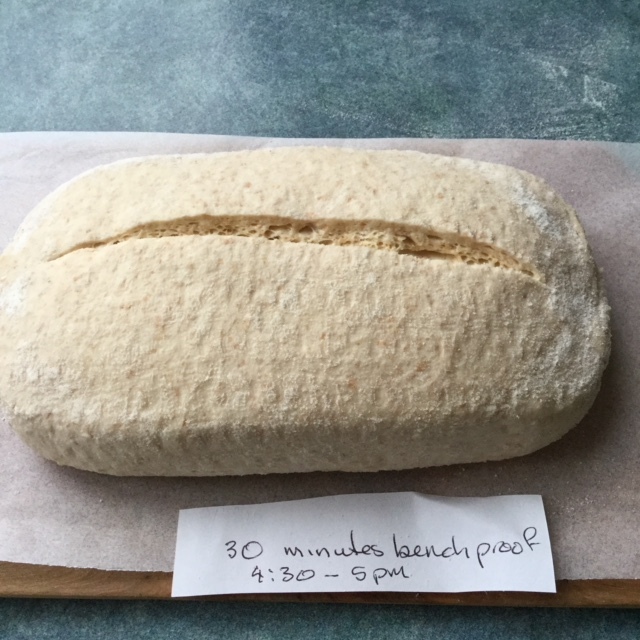 Only in the 120 minutes bench proof loaf was there any real difference. Dough had obviously lost a bit of omph and the score opened but not as much as the others, it was a bit flatter for sure. I wonder if I do 8°c proof, if I need to shorten BF somewhat to balance, but then its not comparing apples with apples.... ?????? 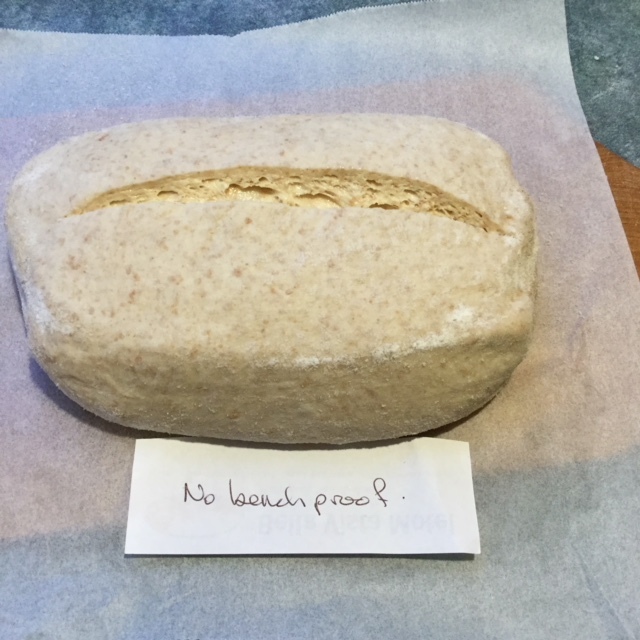 with the comparing apples with apples and then that awful feeling that you might overproof loaves ...even for an experiment it goes against the grain!!!! I just baked some high hydration mainly white with a longer bulk and put them in the wine cooler for 16hours at 4C setting...15 min bench proof time at 22C room temp. 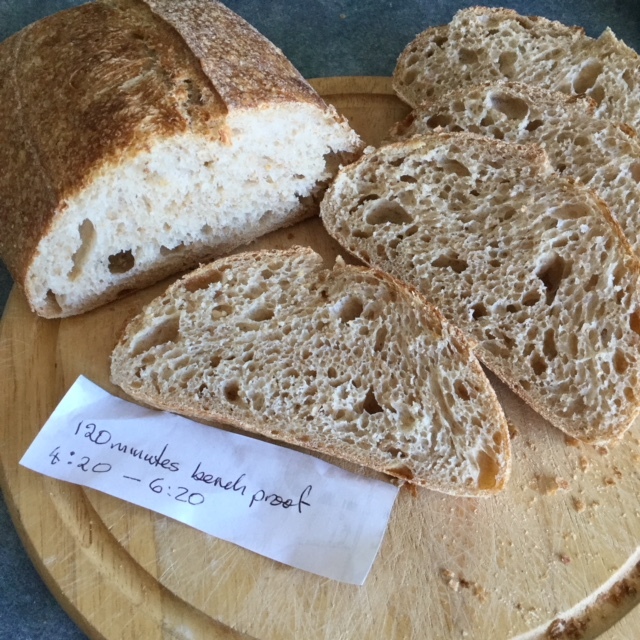 The 8c was without a doubt overproofed but still nice crumb and the others were borderline! Leslie, I understand your concern about grossly over-proofing your dough. But, absolute failure (grossly over-proofed) is a telling success. If an experiment can go from complete failures on both the under and over-proofing extremes, the results are more conclusive, IMO. We get to observe the total range of evolution. I beleve that failure during testing is great success! Kat, the temperature fluctuations in your cooler can be eliminated by placing a small fan in the unit. I use an old computer fan and it completely eliminates the problem for me. The little fans are cheap and they run on 12 volts with a converter thta plugs into house current. to earlier post. Want to keep photos together for comparison. so far not much difference. Leslie, thank you for sharing your experiment results on TFL, lots of hard work and time invested! 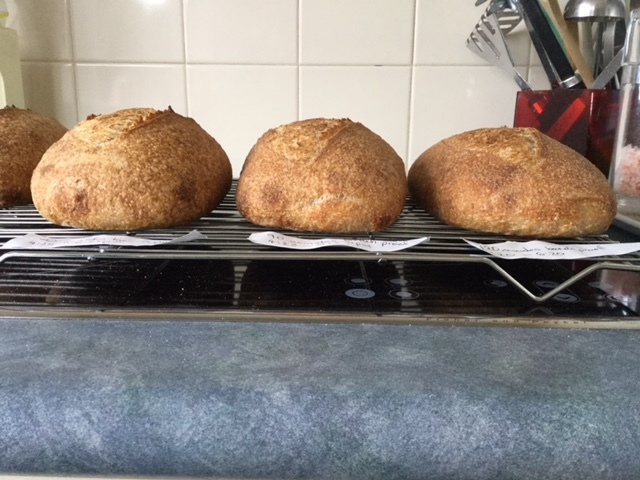 I smiled when I saw the picture of all your loaves lined up...it reminded me of the variability in my day to day bread baking results, nothing is ever exactly the same. Such a seemingly simple process but so many possibilities, variables and things to tweak. 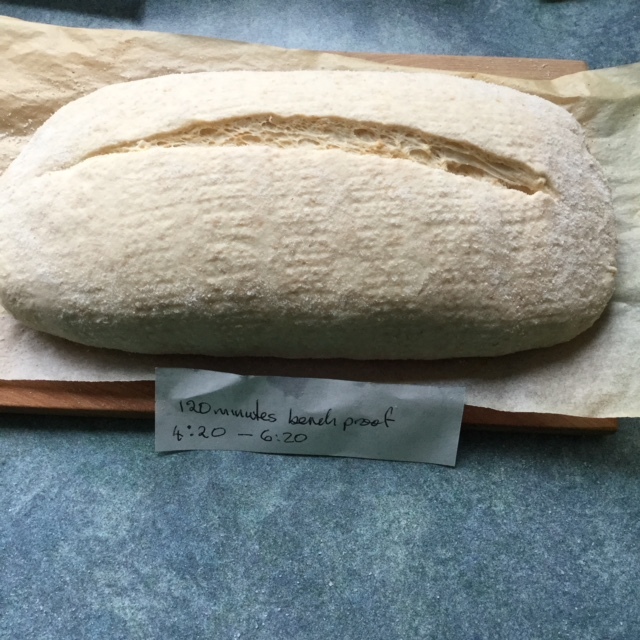 All things considered in your experiment, I would be pleased to have any one of your loaves, they all look good to me! will be obvious. my reading of Michael Suas book is teaching me many things (although I may need to read it several times for it to stick) and it triggered this bake. Mariana’s comments have jogged my memory and I re read a lot of that post “chasing thin and crackling crust” . I still have so much to learn. it is amazing how complex a seemingly simple process can be! photo added to other earlier crumbshots. Leslie, it looks like we are coming to a consensus. Your test seems to confirm mine. The breads baked early have more open crumb. Take a look at This video . The main goal of that video is to study the evolution of the alveoli, but there is pertinent information regarding proofing. I’m beginning to think that what we have been considering “perfectly proofed” is often over-proofed. And the e act sam3 thing with Bulk Ferments. It has beed hard to accept Trevors and Maurizio’s advice for sch a short BR. But, I’ve come to accept that there is wisedom in that advice. I am always pushing the ferments for more flavor, but I think this is why I can’t manage nice ears and big bloom. My doughs are shot. now I am not sure. have a look at today's photo. the further into the loaf I cut, the more open it was. Haven't seen that on earlier cuts. Maybe I will cut it today, not sure. This time I think it is different but owuld love to know what others think. Initially, it seemed obvious that there was a trend evolving. Bakes 1-3 (0, 30, & 60 min proofs) appear to be digressing as far as open crumb is concerned. AND THEN, the fourth bake (90 min proof) shows dramatically open crumb again. How do we explain this? I like testing. Because if we take care to controll the variables, “it is, what it is”. Often times the results shock us. What we thought we knew, was wrong. It can slay our pride. BUT now, we know... A least until something else comes along to challenge that thought. The truth can be elusive, and often it can be difficult to accept when it contradicts our former beliefs. But then again, “it is, what it is”. It can take a boat load of humility, to accept contradicting facts that challenge our preconceived notions. ”truth sets us free”... I only wished it wasn’t so darned elusive at times.